This whole race war brewing between teams is dumb, can’t we all just get along? 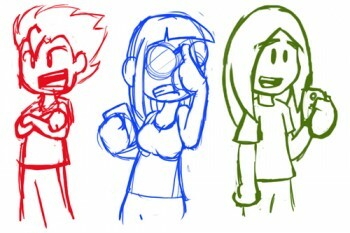 And as a little bonus, here’s the sketches I did before vectoring. If you wanna show that your team is the best one, I’m also selling some Vinyl Decals, so go get one! Pokemon go has taken the world captive. Glad to see another live comic mr. Wood. See ya around. I am Kayos gaiden artist. Will start being more active on other posts.